The author of the masterpiece, Mikhail Nesterov, from childhood loved to draw. Especially still the young author managed landscapes. An adult artist, born in Ufa, quickly became known in secular circles of the capital. Success came to Nesterov after the exhibition of his most recognizable painting “The Vision to the Youth Bartholomew” in 1890. Even then, critics noted not only the subtle spiritual background of the work, but also an excellent technique of depicting nature. Later, already possessing a recognizable and loud name, the master wrote many more canvases, among them “Dali”. 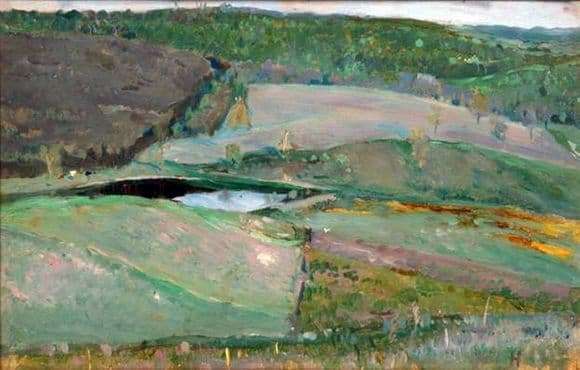 The work is not as well known as the other masterpieces of Nesterov. However, no less valuable. The picture is painted in oil on canvas and carries a whole palette of shades of green. Looking at the plot, one can feel the vastness of the Russian land, the breadth of the human soul. A small lake is hidden among the grassy hilly landscape. That it instantly attracts the eye to itself and is a kind of center of the image. The picture says summer, but the yellowed trees hint at the imminent approach of autumn. In this picture, perhaps, all of Russia is collected. Almost in all regions of the country and now there are similar landscapes. Bright, green, giving a feeling of air and lightness. In parallel, there is a feeling of timid longing from the coming autumn. “Dali” is a magical reminder of what a wonderful place we were lucky to be born and live.